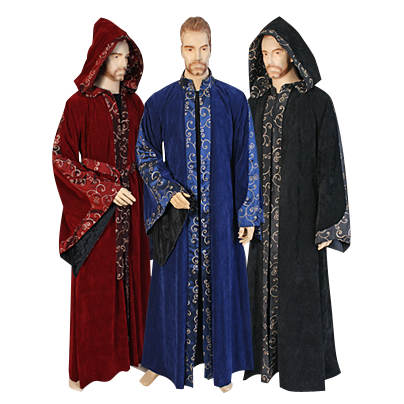 No self-respecting sorcerer or reliable ritual master worth their salt would dare be seen without a fine robe draped over their shoulders, which is why this Embroidered Mystic Coat is such a find, as it brings a magical touch to any fantasy ensemble. Perhaps the most stunning feature about this coat is the material, as it is crafted from soft, suede material that makes the coat a delight to handle and wear. It is heavy yet comfortable, and features long, billowing sleeves that are accented with taffeta designs, done in twisting gold lines. The coats middle-line and neck features matching taffeta decorations, while its long, flowing design give it a mystic and mysterious look that suits well almost any look that wears it. The coat is available in three colors and four sizes, as well as in two different options, with or without the hood. It also includes a matching embroidered belt that is perfect for keeping the coat closed. 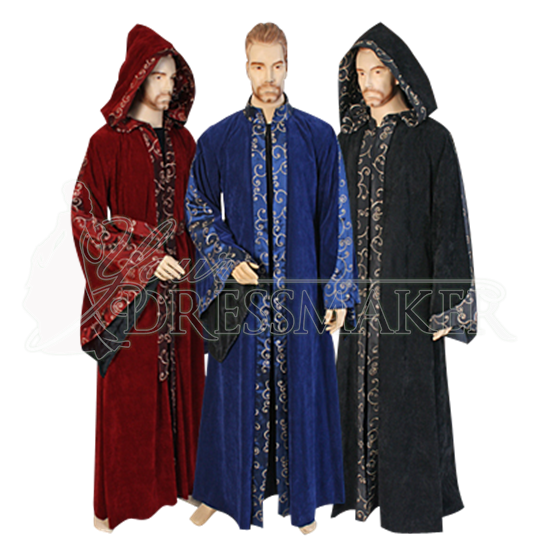 You will look like a wielder of the ancient and arcane arts when you wear this Embroidered Mystic Coat, and thanks to how comfortable it is to wear, you will feel like a king when you wear it, too.